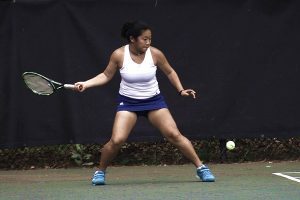 The 21-0 Chamblee Lady Bulldogs broke the serve of their three Woodland singles opponents a total of 16 times on the way to a 5-0 sweep to reach the Class 5A girls’ state playoffs Sweet 16 on Thursday at Chamblee. Junior Olina Bilukha was the first one to clear a court with quick 6-0, 6-0 win over Woodland’s Gloria Gore to run her 2017 record to 15-0. 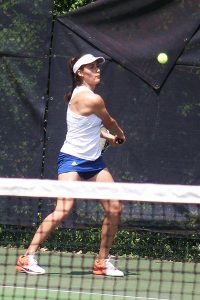 Bilukha had six of the service breaks for Chamblee in her match and improved to 48-0 in her three seasons playing singles. The No. 1 doubles team of sophomore Madeline Meer and freshman Madison Trinh also had a clean slate against Woodland’s team of Caroline Gore and Michelle Maserjian in a 6-0, 6-0 win. The pair teamed up to break their opponent’s serves six times as well as they improved to 6-0 on the season. Sophomore Grace Pietkiewicz upped her record to 13-1 (12-1 at No. 2 singles) on the season with a 6-1, 6-0 win over Woodland’s Deanna Dodson. Pietkiewicz also broke Dodson’s serve on six occasions and only game loss was a service break against her. Senior Leeza Ershtein collected six more service breaks for Chamblee as she downed Woodland’s Ashlyn Walker 6-0, 6-1 at No. 3 singles to improve to 20-0 (18-0 at No. 3 singles) on the year. Walker won her serve in the first game of the second set to pick up the one game in the match. Senior Kendalle Smith and sophomore Emilya Ershtein teamed up for a 6-2, 6-4 win at No. 3 doubles over Woodland’s Becky Wesley and Breanna Shook. The pair improved to 6-1 on the season with the victory. The Lady Bulldogs put their undefeated mark on the line today at 4:00 pm against Bainbridge at Chamblee in second round play. In other girls’ Class 5A play, Arabia Mountain (6-3) dropped a 3-0 decision to visiting Rome on Thursday to fall out of the state playoffs. The Southwest DeKalb Panthers (11-10) had their season come to an end as visiting East Paulding took a 3-0 win in the Class 5A boys’ first round match. The Tucker Tigers (13-2) and Lady Tigers (13-2) both face Creekview in second round play of the Class 6A state tournament. They host at Sugar Creek Golf and Tennis Club at 5:00 pm on Monday (April 24). The Chamblee Bulldogs (13-5) play host to McIntosh at 2:00 pm on Monday (April 24) at 2:00 pm in an effort to reach the Elite 8 of the Class 5A state tournament. In Class 4A girls’ action, the Druid Hills Lady Red Devils travel to Heritage-Catoosa for their Sweet 16 match.